Chris Kassaris is encouraging everyone to get behind the 24-Hour Challenge to raise much-needed funds for SMA Australia. SMA Australia will host the inaugural SMA 24-Hour Challenge on Thursday, August 30, to raise much-needed funds to support Australians living with Spinal Muscular Atrophy (SMA), which is the leading cause of death for infants under the age of 2. SMA Australia provides support services to people living with SMA which includes their lifesaving Cough Assist Program, their Wellbeing Program, and they also offer palliative care. 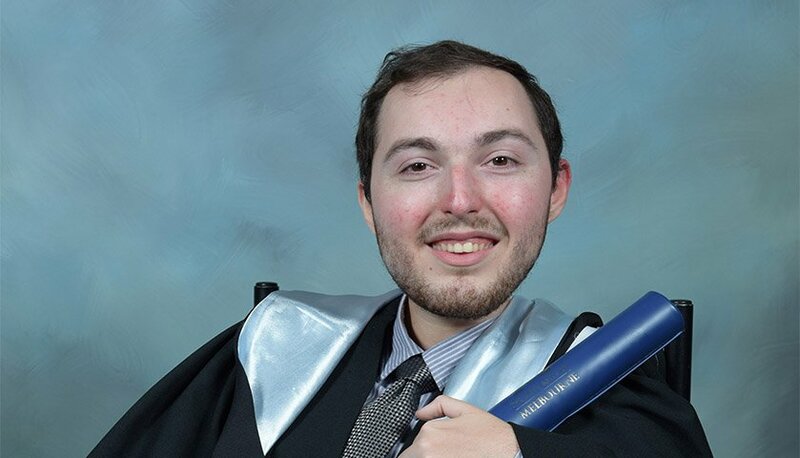 Since being diagnosed with SMA when he was 15-months-old at the Royal Children’s Hospital, Chris Kessaris has epitomised what it means to persevere in the face of adversity and is encouraging everyone to get behind the worthwhile cause. Every donation that is received on August 30 will be quadrupled. Chris, now 25 from Essendon, has been struck by three cases of pneumonia, which can be deadly for someone with SMA. He was in intensive care for a month after his lungs collapsed twice, used to suffer from asthma, and had surgery on his spine to treat scoliosis, a symptom of the SMA. Simple, every day actions, like brushing his teeth, is a challenge for him but he’s never let that faze him. “I completed my high school studies and gained a scholarship to the University of Melbourne to study a Bachelor of Commerce, which I have now graduated. I love socialising with my friends, attending sporting events; I love doing things that any normal 25-year-old would do,” Chris said. Spinraza is a medication that dramatically improves motor function for people with SMA, was approved by the Pharmaceutical Benefits Scheme in May 2018, but the Federal Government announced that it was only available to patients under the age of 18. Chris said he never felt so disappointed in his life when he heard the medication, that he was waiting for so many years, was not available to him simply because he was an adult. “I felt devastated as I have been suffering from this disease for my entire life. To be told I couldn’t have a life-changing drug because I’m 25, in the prime of my life, was devastating,” Chris added. “I really hope that in the near future adults like me will have access to the drug as I believe we are all deserving of a better future especially when we as adults have been through so much already,” Chris added. SMA Australia CEO Julie Cini wants to achieve everyone should have access to Spinraza, which can cost up to $125,000 per dose. “It dramatically improves their motor control functions and would dramatically improve their livelihoods. The Federal Government has done an incredible job to make the drug accessible to children but more needs to be done for adults,” Julie said. Julie, who has been leading the fight to place Spinraza on PBS for years, is also encouraging adults with SMA to register to their database so the government can get an accurate number of Australian adults living with SMA so it is appropriately funded early next year. To register please visit: http://smaaustralia.org.au/support-services/sma-patient-registry. SMA is a genetic disease that affects the muscles. People with SMA are not able to stand or walk unaided and can suffer breathing and feeding difficulties as well as hand tremors. SMA is also very similar to Motor Neuron Disease (MND) but afflicts children and can carry on into adult life. The disease can also affect adults without warning. “I encourage everyone to get behind our 24-Hour Challenge that will further help us in our work that supports Australians living with SMA and their families,” Julie, who lost two children to the fatal disease, added. To make a donation to SMA’s 24-Hour Challenge on August 30 please visit: www.smaaustralia.org.au.